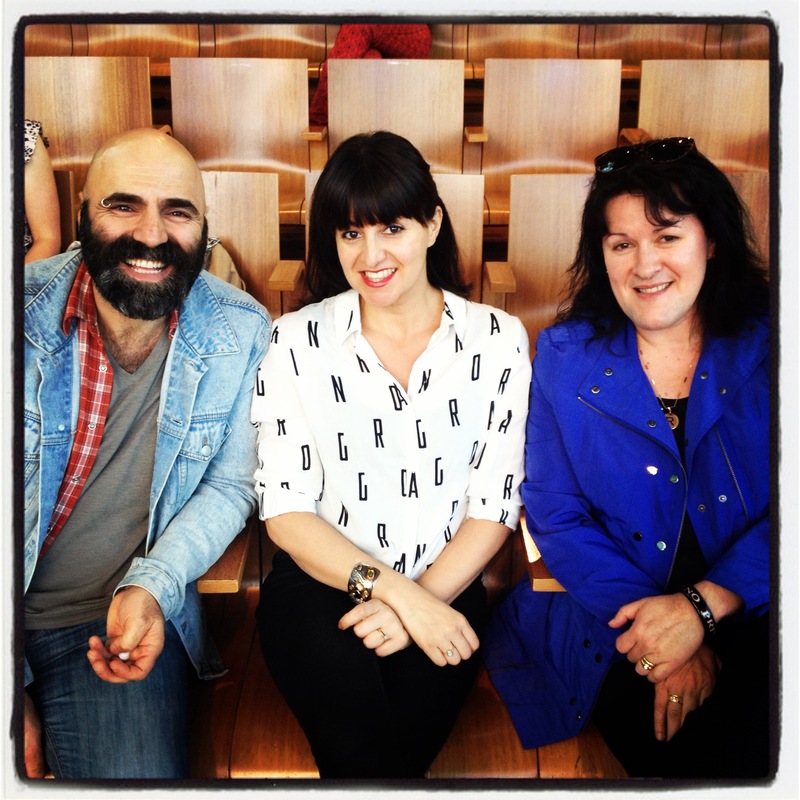 Last night I attended the Clothing Exchange event at Federation Square in Melbourne. It’s a place where you can come and swap some items that you no longer wear in return for some new ones. You’re able to bring up to 6 items of either clothing, shoes, bags or accessories. In return for your items you receive ‘buttons’ which you then use to shop with. The key to this event is to get in early and scope out the goods. That way as soon as the event starts you pretty much have your eye on some key pieces you want to try. Be warned though- there are plenty of elbows-in-the ribs! I’ve attended a few of these in the past and while the concept is a fantastic one it can be pretty hit and miss some times. You may walk away with 6 amazing items or you may walk away empty handed. I suggest that even if you don’t find anything you particularly like you should take something to at least swap at the next event or pass on to a friend. All the left over items at the end of the evening are donated to the Red Cross and sold through their various op shops. Chris Drossos (Red Cross Retail Co-ordinator), moi & Rina Chia from Take 2 Markets. I personally think a swapping event is a great way to move some things from your wardrobe. Not old and tired looking pieces but good quality ones that you are perhaps sick of or just don’t wear anymore. You can even try having a clothes swap amongst friends- call some girlfriends over and each bring something you don’t wear anymore and see if someone else could use it. Chances are you and your friends have a similar style anyway. This works really well with shoes and particularly handbags as they have no size at all! 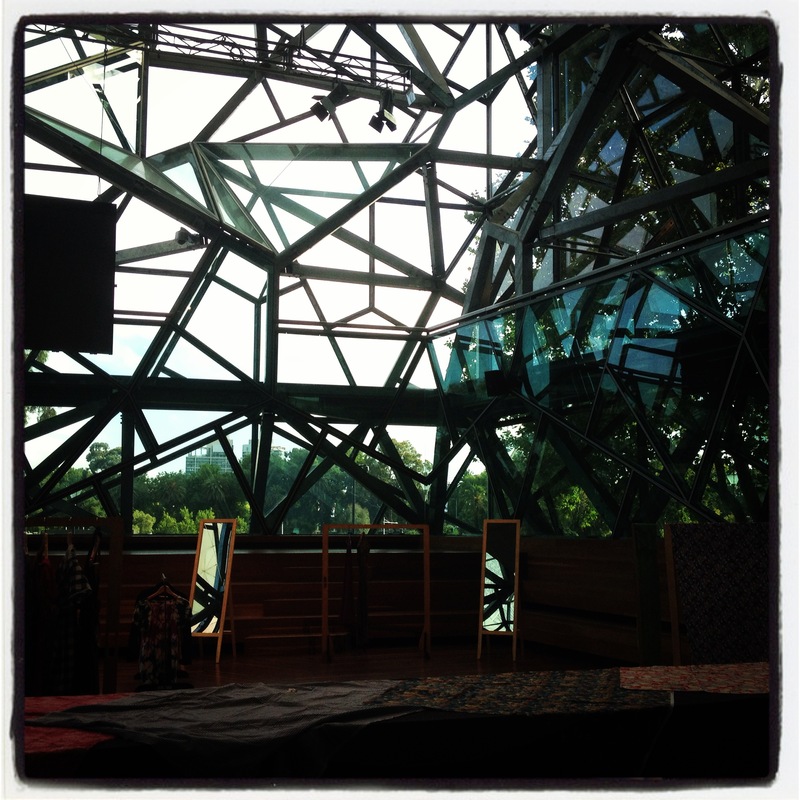 The beautiful surrounds of Deakin Edge at Federation Square where the event was held. So last night a took in a black maxi skirt, an Ojay summer tunic, a couple of blouses, and 2 pairs of ASOS jeans. Items which were still in top nick but I just don’t wear anymore. I handed them over to the assistants to cast their careful eyes over (items are carefully scrutinised to make sure everything is pretty much on par). I was then given my 6 buttons and ready to ‘shop’! Unfortunately I was too busy gossiping before hand to really get a good look at all the items being hung up prior to starting time. So I was left wandering around aimlessly for a while but none the less I did manage to pick up a few great pieces that I was happy about. A pair of faded Levis which had just the right amount of rips and tears. I did the waist around the neck trick to see if they would fit me (I rarely try things on, I’m more of a buy and then try at home kind of gal). Do you know it? Apparently if you put the waist of the jeans around your neck and the two ends meet then they should fit you. True story. Try it. Next up was this super cute silk ASOS blouse. Love this one. 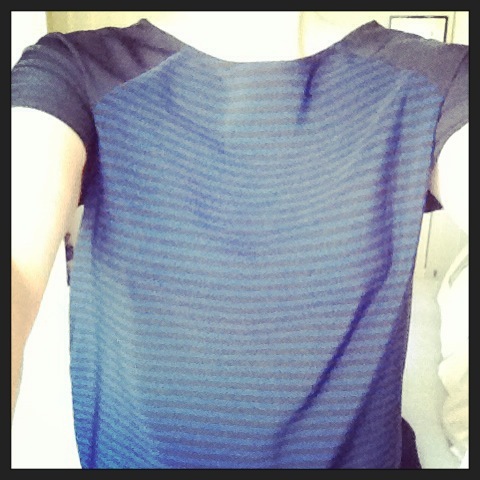 Do you like the photo that looks like I’m headless? 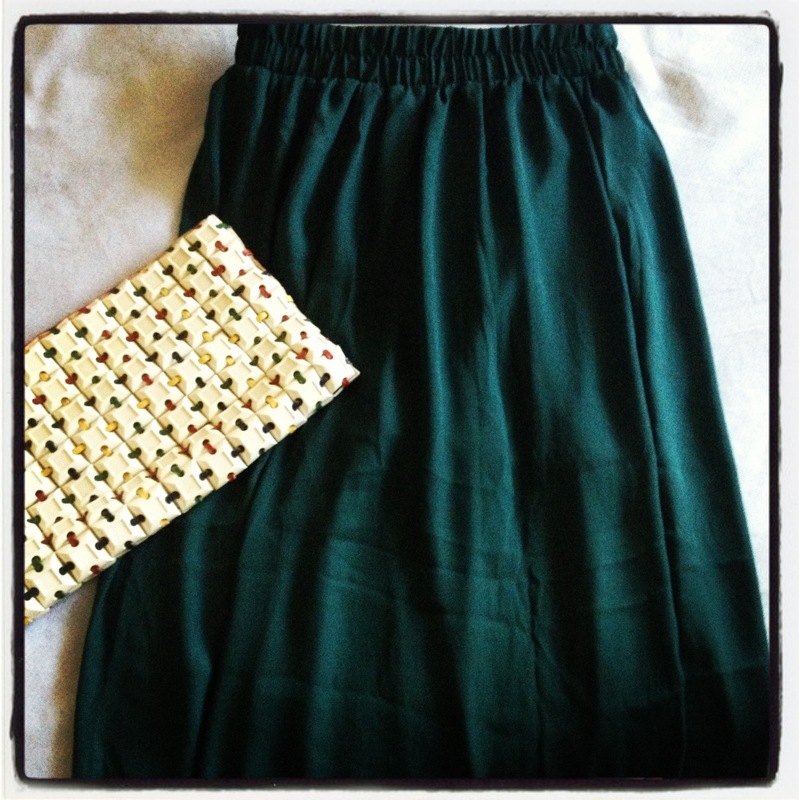 This emerald green maxi skirt which I thought would be great for Christmas lunch with a white tee and some clogs. 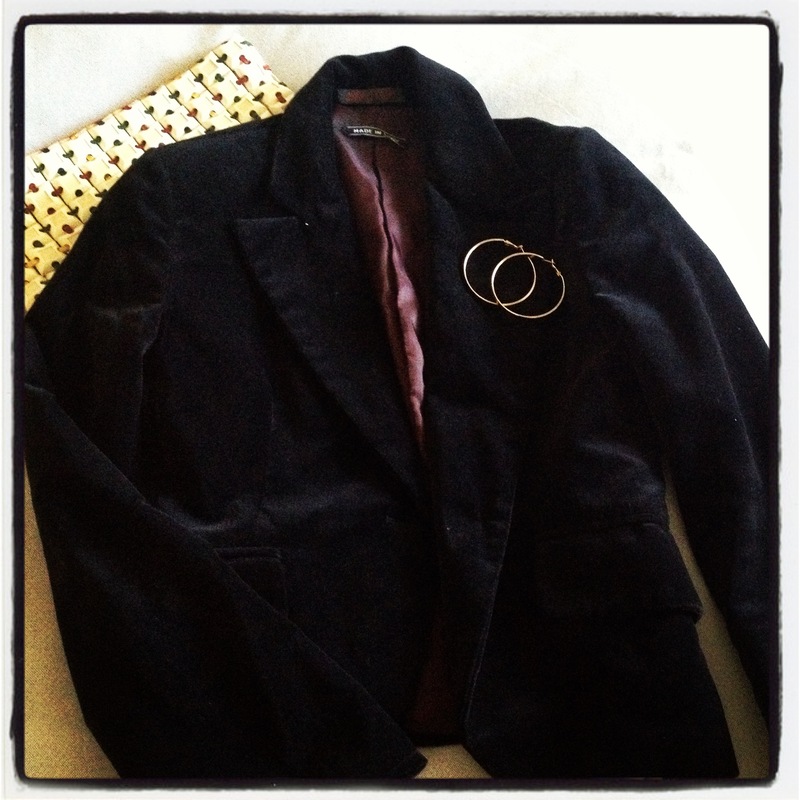 But my absolute favourite was this Italian velvet blazer which fit me like a glove! It’s just perfect. In fact thanks to Melbourne’s ridiculously cold summer I even got to wear it today. 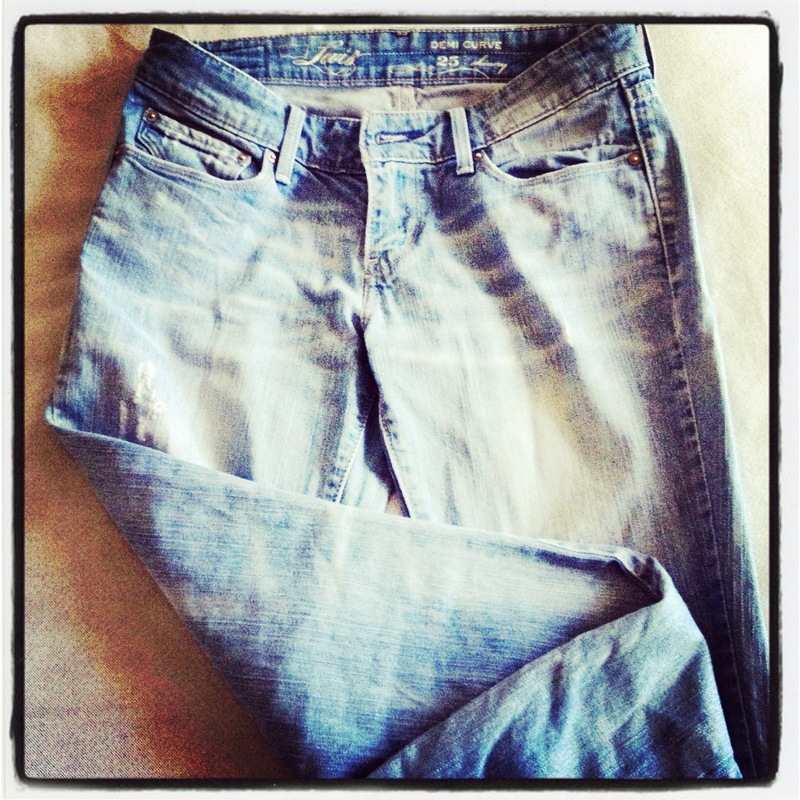 Love the jeans tip, going to have to try that one out! true story….my resourceful Asian customers taught me that trick years ago.